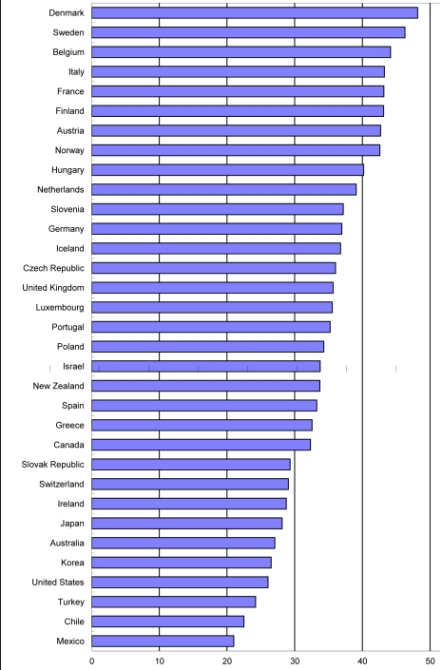 U.S. Tax Burden Good News? You are here: Home » Blog » Government » U.S. Tax Burden Good News? The Organisation for Economic Co-operation and Development (OECD) released its revenue statistics today and it contained some good news for residents of the United States. Well, maybe not “Good News” but “Less Bad” news. It seems that the tax burden in the United States is not as bad as it is in the majority of the other developed countries in the world. The OECD statistics show that as a percentage of GDP Denmark has the highest tax burden with the Danish government absorbing almost half of their GDP (48.2%). Sweden was a close second at 46.4%. Other European countries also had high tax burdens with Belgium close behind. Followed by Italy, France, Finland, Austria and Norway, each having tax burdens of over 40%. At the other end of the spectrum Mexico had the lowest tax burden at 17.5% of GDP and Chile was second with 18.2%. The “good” news is that the U.S. falls toward the bottom of the list at “only” 24%. Aren’t we “lucky” our government only takes 1/4 of our income?